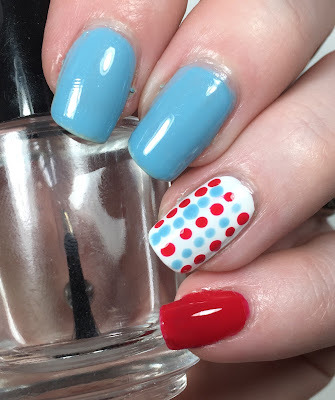 Today I have a mani to get you in the spirit of the 4th of July! If you are looking for inspiration to show some easy patriotic spirit then look no further than here. You know that I am not much into nail art. Dotticures are the extent of my "nail art". So when I was offered these three colors ready for the 4th, I knew exactly what I was going to do with them. 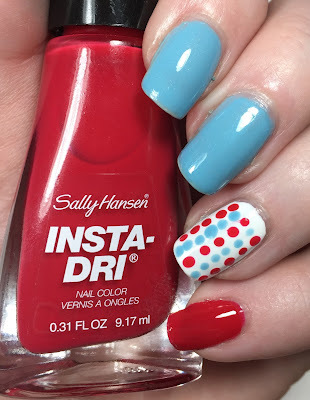 Sally Hansen has six new colors in their Insta-Dri line and retail for $4.99 each. I was provided with three of those colors and I am using all of them in this manicure. I was given Tag, Ur It!, which is a clean white color. It applied VERY easily and can pretty much be a one coater. Vandal Eyes was also sent and it is a shimmery light blue that is thin upon application. In the photos below I have three coats on the nails. Lastly I got Quick Brick which is a bright red. This one is also almost a one coater. Of the three I was blown away by Tag, Ur It! and Quick Brick. I highly suggest getting those two. In the following photos I have Vandal Eyes, on index and middle finger, Tag Ur It!, on the ring finger, and Quick Brick on pinky (and the not pictured thumb). Two coats of Tag Ur It! and Quick Brick and three coats of Vandal Eyes all topped with Glossy Glam. I did experience shrinkage with these, but that is VERY unusual for me but I just wanted to mention it. The dots are Quick Brick and Vandal Eyes. If you want to snag any of these colors just check out your local retailer (places like Wal Mart, Target, Rite Aid, Walgreens, CVS, etc). They retail for $4.99 but keep your eyes open for sales and coupons! 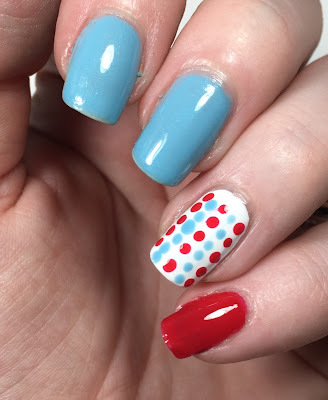 Very nice fourth of July mani! I love this! Quick Brick is a great red.